Because of continuing research, the structure of the Y-DNA Haplogroup Tree changes and ISOGG does its best to keep the tree updated with the latest developments in the field. The viewer may observe other versions of the tree on the Web. Email Alice Fairhurst if the differences need clarification. Identical SNPs that were discovered separately are listed in alphabetical order, not necessarily in the order of discovery, and separated by "/". Examples: M40/SRY4064/SRY8299, P2/PN2, DYS271/M2/SY81, M180/P88, P1/PN1, M191/P86, P253/U247, P252/U174 and M41/P210. Y-DNA haplogroup E would appear to have arisen in Northeast Africa based on the concentration and variety of E subclades in that area today. But the fact that Haplogroup E is closely linked with Haplogroup D, which is not found in Africa, leaves open the possibility that E first arose in the Near or Middle East and was subsequently carried into Africa by a back migration.E1b1 is by far the lineage of greatest geographical distribution. It has two important sub-lineages, E1b1a and E1b1b. E1b1a is an African lineage that probably expanded from northern African to sub-Saharan and equatorial Africa with the Bantu agricultural expansion. E1b1a is the most common lineage among African Americans. E1b1b1 probably evolved either in Northeast Africa or the Near East and then expanded to the west--both north and south of the Mediterranean Sea. Eb1b1 clusters are seen today in Western Europe, Southeast Europe, the Near East, Northeast Africa and Northwest Africa. The Cruciani articles (references and links below) are indispensable resources for understanding the structure of this complicated haplogroup, but note that the Cruciani haplogroup labels are now superseded because of the recently discovered new SNPS that lie closer to the root of the E branch of the Y-haplogroup Tree. A caution on clade labels: Because knowledge of this branch of the Y-chromosome tree has advanced so quickly in the last few years, different clade labels can be found in current use for the same SNP-determined branch of the tree. For example, it is still common to see E3b1 and E3b2 used to distinguish between the M78 and M81 branches of the tree though greater resolution is now possible. Battaglia et al, Y-chromosomal Evidence of the Cultural Diffusion of Agriculture in Southeast Europe European Journal of Human Genetics, 249. 2008. Bortolini et al, Y-Chromosome Evidence for Differing Ancient Demographic Histories in the Americas. American Journal of Human Genetics, 73:524–539, (2003). Cadenas et al, Y-chromosome Diversity Characterizes the Gulf of Oman. European Journal of Human Genetics, 16:374-386, 2008. Cruciani et al, A Back Migration from Asia to Sub-Saharan Africa is Supported by High-Resolution Analysis of Human Y-Chromosome Haplotypes. (pdf) American Journal of Human Genetics, 70:1197-1214, 2002. Cruciani et al, Phylogeographic Analysis of Haplogroup E3b (E-M215) Y Chromosomes Reveals Multiple Migratory Events Within and Out of Africa. (pdf) American Journal of Human Genetics, 74:1014-1022, 2004. Cruciani et al, Molecular Dissection of the Y Chromosome Haplogroup E-M78 (E3b1a): A Posteriori Evaluation of a Microsatellite-Networked-Based Approach Through Six New Biallelic Markers. (pdf) Human Mutation: Mutation in Brief #916, 2006.
. Deng et al, Evolution and Migration History of the Chinese Population Inferred from the Chinese Y-chromosome Evidence. (pdf) Journal of Human Genetics, 49:339-348, 2004. Flores et al, Reduced Genetic Structure of the Iberian Peninsula Revealed by Y-chromosome Analysis: Implications for Population Demography. (pdf) European Journal of Human Genetics, 12:855-863, 2004. Henn et al, Y-chromosomal Evidence of a Pastoralist Migration through Tanzania to Southern Africa. PNAS, vol. 105 no. 31 10693-10698, 2008. Sims et al, Sub-Populations Within the Major European and African Derived Haplogroups R1b3 and E3a Are Differentiated by Previously Phylogenetically Undefined Y-SNPs. Human Mutation: Mutation in Brief #940, Online, 2007. M243 moved from E1b1b1b2b to E1b1b1; M329 changed from private to confirmed; added L29, L66 and L67; changed note for L18; added Cadenas et al to References on 10 March 2009. Changed note for L18, Moved M31, L19 and L29 to different subclades on 22 April 2009. 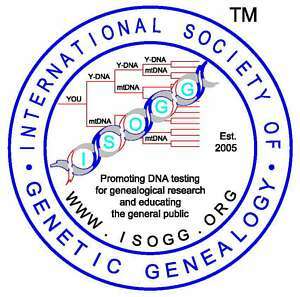 Copyright 2009. International Society of Genetic Genealogy. All Rights Reserved.